The problem to be solved is that I regularly need to charge multiple things at the same time in my kitchen, and I don’t want to waste too many wall outlets, or, be constantly plugging things in and out. I need the ability to charge Apple devices like my iPhone and my iPad, and, to be able to charge my Bluetooth speaker, my Bluetooth headphones, and my wide array of bike lights from CatEye. The iDevices all have lighting connectors, and the speaker, headphones and the bike lights are all Micro-USB. Since both my lightning and Micro-USB cables have a USB-A plug on one end, my first attempt at a solution was to keep the mains power to USB adaptor that came with my iPhone plugged in to one wall outlet (or socket as we say on this side of the pond), and to swap the cable as needed. This very soon made me cranky for two reasons. Firstly, I often need to charge both my headphones and my iPhone, or my iPhone and a bike light at the same time, and secondly, I hate loose cables, and this way there was always one cluttering my kitchen counter top! It cost less than £10, is no bigger than the iPhone power brick in two out of three dimensions, and is sufficiently compact in the third, and it has two ports. It arrived a little over a week ago, and I’m very pleased with it – it’s physically solid, and does exactly what it says on the tin. 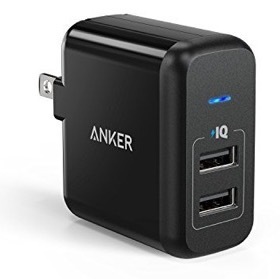 If you’re fed up of having too many USB chargers around, why not grab one of these, or, the four-port variant UK Affiliate link to Anker 4-Port USB Charger, US Affiliate Link to all Anker 4-Port USB Chargersand make your life just that tiny little bit more pleasant! Oh – and remember to use Allison’s Amazon affiliate link at podfeet.com/amazon[podfeet.com/amazon](http://www.podfeet.com/amazon). Steve and I have the 4-port Anker USB charger and love it. One thing Bart didn’t mention. Anker has what they call PowerIQ. This technology dynamically detects and adapts to your device’s unique charging protocol. I haven’t done any testing on this myself, but they say you’ll save a lot of time charging with their charger blocks. I also have the 9-port Anker USB hub/charger for my desk. 7 are data ports, while the other 3 are power only with PowerIQ. One last thing – Bart mocked the name, but that’s just the name it has on Amazon. Companies put all that glop in so that searches for iPhone 6 or Galaxy S8 will find their devices. 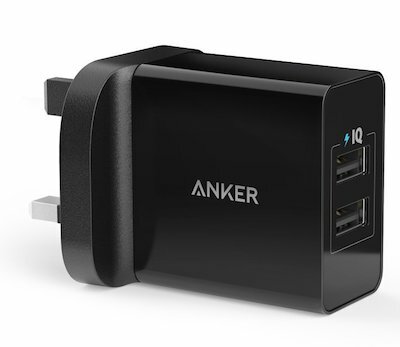 The name Anker gives it on their site is simply “PowerPort 2 Wall charger”. I find my 4-port Anker USB charger one of the most useful devices in my travel bag. I love the Anker products I have, too. I have the 5-port charger for travel — as well as for when my grandchildren are here and all need to top off their iPhones at the same time. I also have a 10-port hub on my desk; it has seven USB slots and three PowerIQ ports. One little note: on a previous hub I had, I was constantly “guessing” which ports were which (charge-only? USB?). With this hub, it’s very easy to see at a glance which are which.